Ferrets have powerful, distinct and engaging personalities, and a playful and fastidious nature. Ferrets are diurnal creatures with their periods of greatest activity just before sunrise and shortly after sunset. They sleep about eighteen to twenty hours of the day, waking up twice a day for very active periods of about two hours. Due to their very high metabolism, ferrets also awaken roughly every four hours for a few minutes to eat, relieve themselves, and play briefly. 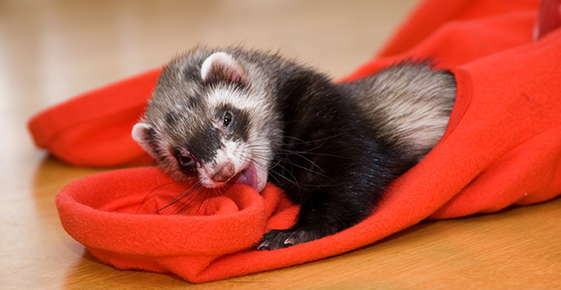 When they wake, ferrets shiver very noticeably for periods up to twenty minutes. This is normal as the ferret is increasing his body temperature after sleep due to his higher metabolism and inherently higher body temperature. As burrow-living animals, ferrets require a dark, quiet place to sleep. The most suitable bedding are old towels, sweaters, pants and the like in which they can roll up or bury themselves. Ferrets are extremely curious and will investigate anything and everything. This curiosity is the leading cause of premature death among ferrets. It is important to supervise your ferret at all times when he is at play. If you allow your ferrets to roam about your home, never close refrigerators, washers, driers, etc. without first ensuring no ferrets are exploring the interior or roosting within. Ferrets are latrine animals and prefer to use a specific area for this purpose. Generally, a ferret will relieve himself within a few minutes of waking up. Being small predators, ferrets would be in the middle of the food chain in the wild, so their instinct is to find a sheltered corner as a latrine. All these things make it possible to litter train a ferret with considerable success. The ferret should have a litter box or paper placed in a corner near his nest or in his cage and be confined to the nest/litter area until after he has relieved himself. Afterwards, he can be released to play in the rest of the home as he will not relieve himself again until after his next sleep. The size of the nest/litter area can slowly be expanded as the ferret learns to use a specific area for a latrine, much like paper training a puppy. As a precaution, a litter box can be placed in a secluded, out-of-sight corner of each room for the ferret's use as these are his natural preferences. The use of a fine, dust-free, clumping litter in a litter box or newspapers is suggested. Remember to clean up daily. Ferrets are very playful animals, much like kittens or puppies who never grow up. They have many behaviors related to play and play "hunting" which confuse or even frighten people unfamiliar with ferret body language. The most common action is a "war dance" where the ferret arches his back, throws his head back with fangs bared, often bushing up his tail, and maniacally bounces forward, backwards, sideways, while chittering away. As seemingly mad as this dance may seem, it is only a challenge to come down to his level and play. If you imitate his actions, he will become more frenzied (hard to imagine though this may seem) and start chasing you, stop suddenly, turn, and run: Now its your turn to chase him. Another common message is pawing the ground while semiprone: This is a challenge to a fight or hunt. Paw the ground yourself, and he will jump at you, then retreat. A few more bouts of pawing and jumping, and he will attack your hand or wrist, wrestling it down and attempting to kill it. All ferrets have an affinity for people and want to include their parents in their play which is a major bounding component in a ferret's life. Due to his extremely strong jaws and small, sharp teeth, a young ferret can break a person's skin during these games. Ferrets have thick fur and skin which protects them when they play together and it takes a while for them to realize that we have no fur and only thin skin which is no protection. Once they realize that they are hurting us, ferrets modify their play so as not to do any damage. This rough play is part of a ferret's life, especially when young. Nipping, pinching the skin hard without breaking it, is another invitation to play. Some kits never nip at all, but most that do will eventually outgrow this tendency as ferrets do mellow with age.